Is there anything wrong with this more symmetric aircraft design, and why isn't it used? I imagine a fixed wing airplane design that's a lot more symmetric than what I see today. This symmetric design has wings in the middle of the fuselage (neither high wing nor low wing), and the empennage is a symmetric cross. Two vertical fins, one on top and one on bottom, and two horizontal stabilizers. The tail fuselage would taper symmetrically too, instead of the underslope with flat top we usually see today. This would make the fuselage closer to a Sears–Haack body, which I believe is ideal. The reason I imagine this is so the control surfaces are much more aligned with the center of mass. So the rudders, elevators, and ailerons will not produce any adverse torques when used. I think this will be more efficient, especially when using trims, and also is a simpler design as far as I can tell. To get around the problem of tail strikes, I imagine a single tail wheel attached underneath it. For small aircraft it might not need to retract. For larger aircraft, I don't know how or where it would retract to, but maybe instead some kind of aerodynamic shield can enclose/open around it, like a prolate or oblate spheroid shape. To me this symmetric design seems simpler and versatile. By versatile I mean it looks like it could be used for small and large aircraft, whether prop-engine or jet engine, military or civilian, and not really mattering where the engines are located either. Is there anything wrong with this design? Why is it not used more often? In fact I do not know of a single production aircraft with this design. If anyone knows of any aircraft in this configuration, whether experimental or production, please provide a link so I can read more about it and maybe discover some reasons for its success or failure. The biggest single problem with this is the location of the main spar - across the middle of the fuselage. This might not be a problem for single seat military or sports aircraft but would be a major headache for almost any other design. Imagine trying to load 100+ passengers with 50% of them having to clamber over or under a major obstruction in the cabin. Yes, you can engineer around this but the resultant solution is likely to be heavier and more complex than simply moving the wing up or down and out of the way. You are right, a symmetric layout would reduce flight mechanical complications like rudder movements causing a rolling moment on top of the intended yawing moment. But would it be worth it? Airplanes usually fly straight courses and keep manoeuvring down to a minimum. The autopilot will deal with the cross couplings just fine, and aerodynamically the added control surface deflections are negligible. But the new complications coming with the ventral fin are harder to ignore. As you said, rotation at take-off will be limited and you need to take off B-52 style. Note that the B-52 needs a high wing already to prevent its wingtips from scraping on the runway when there is too little lift to bend them up (beefing up the outrigger wheels would also be an option, but adds weight). Now the aircraft will climb with a nose-down attitude which increases drag slightly. 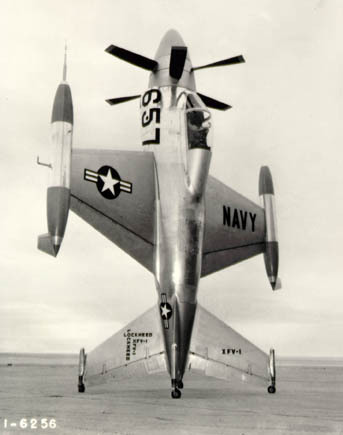 Only the protection for the tail-mounted propeller afforded by the ventral tail justified its existence in the XB-42 (look at the Do-335 for another example). When the XB-42 became the jet-powered XB-43, the ventral fin was removed. Or how should you load and unload large cargo if not with a rear ramp? The ventral tail would make access to this ramp impossible. Loading from the front needs a stronger and heavier nose wheel or additional struts like on the An-124. Woe betide the crew who forgets to lower the strut before unloading the main battle tank through the front doors. This complication never arises with a rear ramp. Now for the fuselage shape: The symmetric tube is not as bad as the current upswept tail, but not ideal. Look at gliders: Here the fuselage follows the upwash ahead and the downwash aft of the wing to create the least drag. But again this will restrict the possible rotation angle at take-off. Especially with wing sweep you are better off with an upswept rear fuselage and a shorter runway. Just think of all the resistance in the population if you need to double the runway length at all major airports. Or do you want to limit the utility of your new design by restricting it to Edwards AFB? Symmetry is only worth it if the aircraft is designed for aerobatics. Even then, a symmetric wing airfoil is much more important than a symmetric vertical stabilizer. You're right that there aren't any production aircraft with a 'symmetric' design. 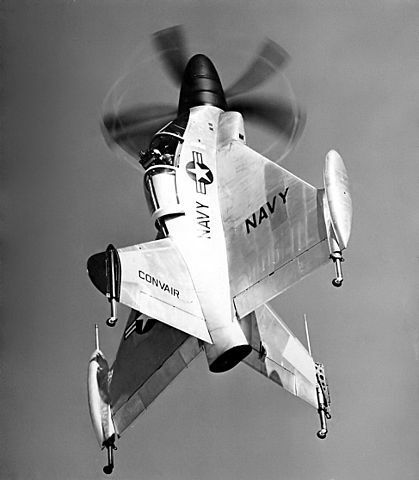 But quite a few experimental aircraft have them, especially the tail sitter VTOL ones- note that even they aren't perfectly symmetrical, showing the issues. Looking at these aircraft alone, we can see some of the issues we would face in these aircraft. The main spar would have to pass through the fuselage, which will severely limit the uses of these aircraft- it would be extremely difficult to use them in passenger and cargo carrying roles (Even if it is used, loading is going to be a problem unless you open the cockpit upward). Having a lower fin would cause problems. Unless you are going to take off vertically (which is rarely preferred), the landing gear size has to be increased as with severe limitation in the rotation angle during takeoff and attendant problems. This will lead to weight issues and runway restrictions. Then there are maintenance problems- if you have to change the engines (which for symmetry, has to be inside the fuselage), the only way is to remove the bottom tail (kinda like the harrier, whose wing has to be removed). Any aircraft has to be designed for production and operation. These issues are too difficult to justify the use of symmetrical aircraft except for very specific purposes- like the XB-47 and Do-335 designed for speed and the XFV and XFV 1 designed for vertical take off. For any other aircraft, the required tradeoffs would be too costly to justify. Why tinker with what's working for something that offers little practical benefits (flight controls are doing fine without symmetry; even if there's a problem, modern autopilots can handle them fine) or just because it looks good on paper? Just to add a very basic consideration to the already good answers here. While there may be minor advantages of having the vertical tail symmetry, there is no actual symmetry in the vertical plane for any airplane, simply because any airplane needs to produce lift - which is the biggest aerodynamic force. The 'ideal' Sears–Haack body is ideal only for drag, without considering the need for lift. This makes the airflow non-symmetric in vertical plane, and thus the optimal body will not be symmetric (even from the purely aerodynamic standpoint, before we consider spars etc.). A high wing, for example, is aerodynamically the most efficient in most cases. It has positive interference with fuselage and will often have less drag than the equivalent middle wing. Even on XB-42 you may notice that the horizontal tail is placed high, above the wing. This is usually done to reduce the effects of the downwash from the wing. Not the answer you're looking for? Browse other questions tagged aircraft-design efficiency fixed-wing or ask your own question. Why are push-propellers so rare, yet they are still around? Why does the B-52 take off without rotating? Can any aircraft adjust the wing dihedral in flight? How can the Antonov AN 225 only have 2 nose wheels? What are the properties of the wing (airfoil symmetry, angle of incidence) of an aerobatic aircraft? Why does the vortex created by wing affects its own angle of attack? Would a vertical stabilizer that extends both above and below the centerline be benefit or hindrance? What are the advantages and disadvantages of level flight with a nose-down attitude? Is the ATR empennage configuration considered T-tail of cruciform tail? How much do 1947 and 2014 Beechcraft Bonanzas have in common? 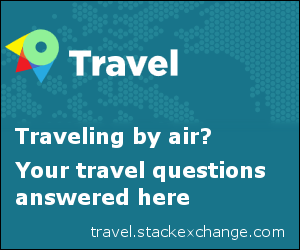 Why is the wing of large commercial jet aircraft usually located below the fuselage? Are NACA airfoils used in modern aircraft design? Why are high-wing aircraft more stable? Has there ever been a sideways H-tail on an airplane? Why does a Phugoid occur? How can it be eliminated? Advantages and disadvantages of air intakes above fuselage/wings in jet fighters? Could the S.H.I.E.L.D. C-17 actually have a sensible center of gravity? Why aren’t there any lifting-canard airliners?